Shrouded in mystery, a secret society convenes with the supposed purpose of bringing new leadership to wartime England. One by one, its members are found murdered, the killings oddly but subtly connected by a thread only the Dark Knight can see... The mystery unfolds in BATMAN: THE ORDER OF BEASTS, a 48-page Prestige Format Special painted by Eddie Campbell (From Hell) and co-written by Campbell and Darren White. 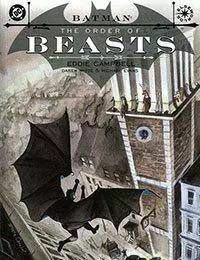 Campbell tells the story of a young Batman who must hone his new detective skills while using them to penetrate the veil surrounding the Order of Beasts. But can he discover the identity of the murderer while navigating the nighttime landscape of a city thats unfamiliar to him?